Do you hear that crash in the distance? The sound of something heavy, something solid crashing down? Well, it's just another bodybuilding supplement toppling off its pedestal. According to a human study done by Darry Willoughby, N-methyl-D-Aspartic Acid, or NMDA for short, billed as one of the most effective testosterone boosters, does absolutely nothing at all. N-Methyl-D-Aspartic Acid [see below right] is an analogue of the amino acid D-Aspartic Acid [below left]. Human studies have shown that the sodium salt of D-Aspartic Acid boosts men's testosterone levels, and so supplement manufacturers launched D-Aspartic Acid as a supplement on the market – as a salt, but also in its free form. It's this last category of supplements that don't work, according to a study that Willoughby published in 2013. N-Methyl-D-Aspartic Acid is created in the body from D-Aspartic Acid. In the testes and the part of the brain that controls the testes, N-Methyl-D-Aspartic Acid is a signalling substance that induces cells to increase their activity. In high concentrations N-Methyl-D-Aspartic Acid can overstimulate brain cells and kill them. This is why supplements containing N-Methyl-D-Aspartic Acid are controversial. 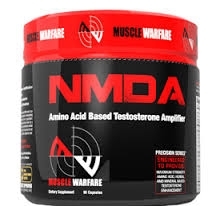 Nonetheless, supplement manufacturers have put this substance in testosterone-boosting supplements, even though no research has been done on whether N-Methyl-D-Aspartic Acid works – and if so, in what dosage? A supplement usually supplies a daily dose of 30-40 mg N-Methyl-D-Aspartic Acid. In the Journal of Sports Science and Medicine, Willoughby published an experiment in which he got 10 male students, all of whom had been doing weight training for at least a year, to take a supplement containing N-Methyl-D-Aspartic Acid for 28 days. The students took 4 capsules a day of Muscle Warfare's NMDA. Its composition is shown below. A control group took a placebo. The supplement had no effect on the athletes' testosterone level, as the figure below shows. The researchers also detected no significant effects on the subjects' concentration of cortisol, prolactin and LH, and none on their strength or body composition. "It is clear that more research needs to be conducted on NMDA supplementation in humans regarding its ability to increase endogenous levels of testosterone, along with its potential ability to increase muscle mass and strength", writes Willoughby. "However, based on the results of the current study we conclude that 28 days of NMDA supplementation [...] does not increase the activity of the HPG axis, nor does it preferentially increase skeletal muscle mass and strength in resistance-trained males when compared to placebo." J Sports Sci Med. 2014 Jan 20;13(1):192-9.